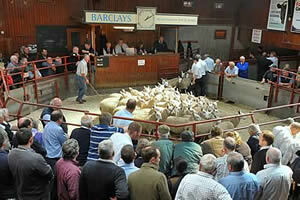 The Cumberland & Dumfriesshire Farmers Mart had forward 6,014 Store Lambs (including 1,940 Cheviots & 1,542 Blackfaces) at their Weekly Sale at Longtown on Tuesday 4th October, 2011. Another excellent show, all classes dearer on the week. Top of £67.50 for Suffolks from The Nook and for Texels from Haggistone Holm and Roan Cottage. Other Suffolks to £64 Low Lonning, £63.50 High Loveladyshield. Other Texels £65.50 Powisholm and Winshield, £65 Westerhopeburn; Charollais £65.50 Townfoot (Rutter); Cheviot Mule £64.50 Geltsdale; Greyface £60.50 Greensburn, £59 Geltsdale and The Knarr, £58.50 Greyside, £58.20 The Nook; Lleyn £51.80 Dolphinston; Swaledale £47.50, £42.80 Byers Hall, £44 Rotherhope, £42 Merryknowe. Blackfaces (1,542) met an excellent trade with a top of £62.50 from Sewing Shields, £55 Greyside and Upper Burnmouth, £54 Lamperts. Hill Cheviots (1,940) a good entry with the best meeting a huge trade. Top of £61.50 Glendinning, £60.50 Meikledale, £60 Hartsgarth. Cast ewes to £80.50 Linton House who sold Hill types at £65 and Cast rams at £67.50.